He worked for various advertisers, including Bissell Carpet Sweeper Company, Swift & Company and Dr. Shoop's patent medicine company. At the age of 41, he was hired by Albert Lasker owner of Lord & Thomas advertising in 1907 at a salary of $185,000 a year, Hopkins insisted copywriters researched their client products and produce reason-why copy. He believed that a good product was often its own best salesperson and as such he was a great believer in sampling. His classic book, "Scientific Advertising," was published in 1923, following his retirement from Lord & Thomas, where he finished his career as president and chairman. He died in 1932. Now available over sixty of the Claude Hopkin's original ads that I have compiled based on his classic books, "My Life in Advertising" and "Scientific Advertising." For the full description of each ad, click here. 2. BONUS #1 Put away your glasses ad images. You'll get all the images of the ads in a separate folder to study up-close. Pick apart every word. Scrutinize the adjectives used. Emulate the offer in each ad. Read every word! Immediately apply what you find and use it in your own offers. 3. BONUS #2 Typed and formatted transcripts of all 60 Hopkins ads. You get the transcripts of each ad in this collection. Once you read the words of Claude Hopkins, you'll want to use them for your benefit. Typing and transcribing these ads are time consuming and a hassle. We've spent several hundred dollars to transcribe each ad in its entirety so you can use them as you wish. Find a section you like in an ad, highlight it, copy, paste and modify the words to fit your product or service. Claude's words live! They are as applicable today as they were when he wrote them ... even more so since he has a fresh, direct, no-nonsense approach that grips you. Put Claude on your staff and bring life profits back into your losing promotions. 4. BONUS #3 The 1903 dead-man's manuscript. Here's the story about a rare advertising manuscript. Wait till you get your greedy little hands on this. It's a rare manuscript by Claude Hopkins' arch enemy and number one rival, J. Walter Thompson. In this 1903 rare 57-page advertising manuscript , you’ll learn J. Walter Thompson’s teachings on the cardinal principles of advertising, marketing and salesmanship. Every lesson and word are still applicable today. You'll learn how The Lord & Thomas advertising agency and the J. Walter Thompson agency were extreme rivals during Claude Hopkins’ day. You'll compare what Claude Hopkins' teaches and what J. Walter Thompson was doing during this bitter rivalry. You'll have the inside tactics on how both competitors approached challenges of marketing and advertising goods and services in the early 1900s. There's nowhere else you'll be able to find this gem. In my opinion, the skill with which these two leading agencies were doing advertising a century ago is better than any time in history. Once you dive into the secrets in this manuscript, you'll know why. 5. BONUS #4 647 secret ad swipe file. You'll also receive access my new and exclusive web site on hard to find ads containing the most effective classic ads from the largest circulated publications during the1950-1960 era (most are over 50 years old). These are the ads used by The Wall Street Journal, Metropolitan Life Insurance Company, General Electric, Ivory Soap, Kellogg’s Rice Krispies, American Express Travelers Cheques, New York Stock Exchange, Quaker Oats, Goodyear Tire & Rubber Company, Motorola, The Sugar Information Inc., Green Giant Company, Postum by General Foods Corp., Reynolds Wrap, Beltone Hearing Aid Company, Listerine mouthwash, and many other companies ... BEFORE they fell into the trap of "Image Advertising." Every ad was selected for this collection only if it satisfied all 5 of the following criteria: it had a powerful headline, compelling copy, was written in editorial style, featured a classic product still around today and was a pure example of "salesmanship in print." I created this additional web site for my personal use to study great marketing ads, and to access a huge bank of killer ads and headline ideas. Now this extra collection of classic ads can be your own personal digital swipe file that you get for FREE when you order this course. I may stop this bonus altogether at any time because -- in all honestly -- A single ad can not only save you hundred if not thousands of dollars in copywriting fees, but when you use it as a model for your own ads it can send your sales conversions through the roof. Claude Hopkins worked for Albert Lasker, owner of the Lord and Thomas advertising agency, which pioneered radio advertising and created some of the first instances of "salesmanship on the air." Lord and Thomas placed nearly half of all national radio advertising on NBC in 1927-28 and in the first four years of radio network operation purchased an astounding 30 percent of all national network time. It created shows for RCA, Cities Services, Pepsodent, Palmolive and yet other accounts Hopkins worked on. Albert Lasker experimented with many radio approaches (he introduced Bob Hope and Amos 'n' Andy to the airwaves, was the first to introduce a daily radio contest, and promoted Bing Crosby, Frank Sinatra and others) but initially insisted on using the same "Reason Why" tone and spirit that permeated Hopkins' copy. 7. BONUS #6 The greatest speech on copywriting ever. Study and modify Claude Hopkins' print ads, learn from the other copywriting masters and you'll gain an understanding about the one of the most powerful money making secret known to man. Your Claude Hopkins Rare Ad Collection will be sent instantly after your order is placed. The second you place your order, Paypal will re-direct you to a page with a yellow button that when clicked will take you to your download instructional page. If for some reason the redirect does not work, I will personally send you a link by email to your download instruction page shortly after your order is received. You'll click on that button to access all your Claude Hopkins downloads. And I'll also send you the links to the Paypal e-mail address used when you placed your order. If you have any questions at all, feel free to text of call me at 858-692-9461. So don't wait, click here to order. You'll have and be able to immediately download all these Claude Hopkins Ads Below . . .
* Nine Nations Now Use Liquozone. Won’t You Try it—Free? * You Can’t Kill Inside Germs With Medicine. Won’t You Try Liquozone—Free? * Do you judge a play by the price of the ticket – or by the performance you see? * Studebaker - How Will Your Car Be Built? * Food Shot from Guns! * How Much of This Difference is Due to Oatmeal? * Does your food cost too much? * Why That Tarter If You Keep Teeth Clean? * Mr. Advertiser, What Does This Mean To You? 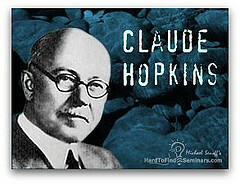 Claude Hopkins (1866–1932) was one of the great advertising pioneers. 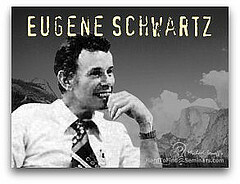 He believed advertising existed only to sell something and should be measured and justified by the results it produced. He worked for various advertisers, including Bissell Carpet Sweeper Company, Swift & Company and Dr. Shoop's patent medicine company. At the age of 41, he was hired by Albert Lasker owner of Lord & Thomas advertising in 1907 at a salary of $185,000 a year, Hopkins insisted copywriters research their clients' products and produce "reason-why" copy. He believed that a good product and the atmosphere around it was often its own best salesperson, and as such he was a great believer in sampling. To track the results of his advertising, he used key-coded coupons and then tested headlines, offers and propositions against one another. He used the analysis of these measurements to continually improve his ad results, driving responses and the cost effectiveness of his clients' advertising spend. Hopkins is one of the father's of modern day marketing. While working for the Bissel Carpet Sweeper Company, at Hopkins' sent out five thousand letters offering carpet sweepers as Christmas presents - one thousand people sent in orders. He also convinced Bissel manufacturers to offer more variety of carpet sweepers, such as making them with twelve different types of wood. Immediately after these changes, Bissel sold two hundred fifty thousand in three weeks. His book Scientific Advertising was published in 1923, following his retirement from Lord & Thomas, where he finished his career as president and chairman. He died in 1932. Charkes Duhigg credits Hopkins with popularizing tooth brushing, as a result of Hopkins' campaigns for Pepsodent. This book was followed, in 1927, by his autobiographical work My Life in Advertising.